Alan Norris aka EnglishRebel was born in Birmingham, England and moved to the United States in 1978 on a 12 month contract as a Project Engineer for the construction of a manufacturing facility. He was like the proverbial distant cousin who came to stay and never left. Having decided that he wanted to participate in the wonderful (and sometimes frustrating) American political system, he became a citizen in 1988 -- having proved to the immigration officer that July 4th really was Thanksgiving (England giving thanks for getting rid of those pesky colonies), and that he did know what the three branches of government were, and could write and speak English, well -- the other English that is. He now lives in the Piedmont area of North Carolina where he is semi-retired from his engineering consulting company. Having been seduced by Reef Central to embrace the black art of keeping a reef aquarium, he is fully engaged in the concepts of 'patience, more patience, money, and more money' (ask his wife if you don't believe it). Although his level of experience was previously limited to a 10 gallon Gourami tank back in the Olde Country, he has dived in (figuratively speaking) at the deep end of saltwater aquariumsand started out with a large (and some would say) complicated system, well - he is an engineer. His other interests are restoring classic cars ( having wrote an article on the trials and tribulations of restoring a 1964 Triumph TR4 for a well known British magazine), woodworking, and computers -- having been an Apple convert since 2008. 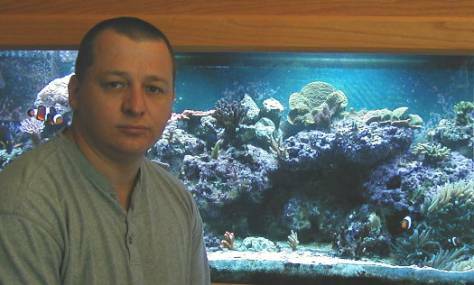 Andrew Trevor-Jones is an amateur aquarist with over 25 years expeience with keeping marine organisms. In the mid-70s, he started keeping the marine fish he caught himself while snorkelling around Sydney, Australia where he was born and raised. At the same time he joined the Sydney chapter of the the Marine Aquarium Research Institute of Australia (MARIA) which also fostered the careers of some notable marine scientists, including Rudie H Kuiter and Dr Ove Hoegh-Guldberg. The blossoming interest in all things marine led to a degree in Marine Science at the University Of New South Wales. Andrew's Honours project was on Cephalopods and particularly the feeding behaviour of a common Sydney species of cuttlefish. Unfortunately, due to a shortage of jobs in Marine Science in 1982 and 1983 (and a poor choice of Honours project), Andrew was unable to find work in the marine field and now works in the computer industry. Andrew now lives in the Blue Mountains west of Sydney where he currently has 9 marine aquariums, including 2 dedicated mini-reef tanks. He is an active member of the Marine Aquarium Society of Sydney (MASS) and with other members of and the Marine Aquariums Societies in Victoria and Western Australia is in the process of establishing an umbrella organisation in Australia: MASA. MASA's aim will be to liase with government, envionmental groups and industry members to improve the marine aquarium industry in Australia and make it more sustainable and lessen the impact on the natural resources. Additionally, MASA will provide resources and information to aquarists in Australia via their local societies. You can communicate with Andrew at his author forum at Reef Central. Anthony Rosario Calfo was born in Hawaii and lives in Pittsburgh, Pennsylvania. He is a lifelong aquarist and an aquarium industry professional that has worked the better part of the last decade as a commercial coral farmer and wholesaler, producing cultured reef invertebrates for the ornamental and zoological trade. In a greenhouse environment, he has witnessed such blessed wonders as spawning Tridacnid clams and Cassiopeia jellyfish growing from medusae to adulthood. After selling his mariculture facilities and retail store, he has worked as a writer self-publishing fiction and non-fiction material for Reading Trees Publications (www.readingtrees.com). He has authored the reef aquariology title, Book of Coral Propagation, Vol. 1 Reef Gardening for Aquarists and will release the second volume of the series in 2003 after the release of a somber, non-hobby title dealing with issues of child abuse in late 2002. He is also a mentor and regular content provider on Bob Fenner's Wet Web Media where he can be reached via e-mail daily for advise and shared opinions as part of the WWM crew. Anthony also enjoys visiting aquarium societies to participate in workshops and to offer presentations on the exciting endeavor of coral propagation and reef aquariology. In 1994 he co-founded the Pittsburgh Marine Aquarist Society with the inimitable Bob Dolan. He was schooled at Carnegie-Mellon University and the University of Pittsburgh, and has a BA in English Literature. Other interests include African felids, music and studio arts. Anthony can be reached through Reef Central, Wet Web Media or personally at Reading Trees: anthonycalfo@readingtrees.com. Bill got his start in marine aquariums early in life by crawling into his Mom's tank of locally caught marine's as a toddler. This led to a lifetime as a confirmed beach bum and rabid aquarist keeping multitudes of marine critters in any container that could hold water. Since merely messing about around the waters' edge and looking into glass boxes wasn't enough, Bill obtained his SCUBA certification in 1983 and went on to Southampton College for a degree in Marine Biology. As a hobbyist Bill has maintained a variety of aquaria, ranging from locally caught natives of the East Coast to tropical fish from around the globe. Having witnessed the evolution of filtration from the lowly box filter to live deep sand beds, he has found the natural methods of deep sand beds the best after witnessing the fauna of the live sand assimilate entire cans of fish food often dumped in by his young daughter. Professionally, Bill has been working in the aquarium industry for over a decade for a variety of retail stores ranging from small Mom and Pop shops to large chain stores. Currently, Bill runs a part-time business from home specializing in collecting (still a beach bum!) and culturing a variety of macroalgeas, live sand, detritivores and few other things as time and interest allow. Bill is married and has an eight-year-old daughter that can't stay out of the water. 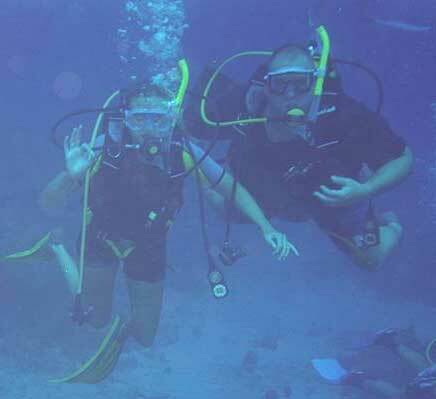 The family enjoys snorkeling together in the Carribean and even allows Dad time to himself for SCUBA and his other hobby of underwater photography. Other members of the family include two Iguana's, a Water Dragon, Blue Tongue Skink and a Tokay Gecko. On Reef Central, Bill moderates the SCUBA forum and co-moderates the Fish DiseaseTreatment and Fish Only & Aggressive Tanks forums. Brian Plankis has always had three career interests in his life: technology, science and education. While most people would choose to focus on one, Brian's background reflects his efforts to integrate all three into his career. 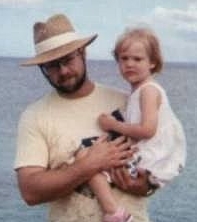 Brian received a BS in Natural Resources and Environmental Science from Purdue University in 1994. After completing three semesters toward an MS in Organic Chemistry, he switched focus and completed an MS in Educational Technology, also from Purdue, in 1997. Following his graduation Brian pursued system analyst positions and is currently the project manager of a remote imaging system for marine mammal observations at the Laboratory for Applied Biotelemetry & Biotechnology at Texas A&M University at Galveston. 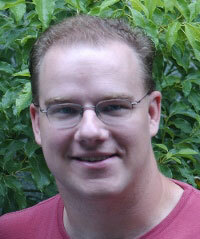 Brian is currently pursuing his doctorate in Instructional Technology at the University of Houston. His dissertation work focuses on effective utilization of instructional technology to produce meaningful learning in science education. 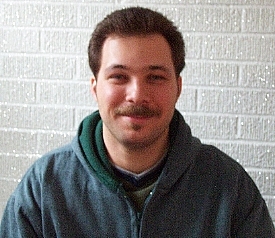 Brian has conducted classroom teaching at the university level in soil science, classroom technology integration and computer literacy. Additionally, he has contributed to research efforts in lake pollution and water clarity, the effects of groundcover and soil type on soil erosion and chemical uptake and binding in soil organic matter. Brian has authored several peer-reviewed publications and conference presentations on a variety of technological and educational topics. Brian entered the aquarium hobby with freshwater tanks and spent seven years keeping freshwater fish while breeding various species of guppies, mollies and angelfish. He set up his first saltwater tank, a 29-gallon, in 1999 and currently keeps a 75-gallon mixed reef tank. He also has spent over 200 hours volunteering for the Shedd Aquarium in Chicago, Illinois and the Texas Marine Mammal Stranding Network in Galveston, Texas. 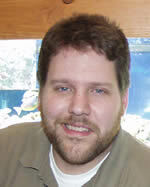 In addition to writing for Reefkeeping Magazine, Brian has been an active member and a presenter for the Marine Aquarium and Reef Society of Houston (MARSH) and was involved in the Chicago Marine Aquarium Society (CMAS). His aquarium interests include fish breeding, invertebrate identification and reproduction, coral propagation and reproduction. Many important issues facing the hobby today interest him, including: educating new hobbyists, the hobby's effects on natural reefs, the humane treatment of animals, and research on live rock hitchhikers and invertebrates. He continues to educate himself on these issues while attempting to identify any ways that he can contribute. When he's not involved with any of the above activities, he enjoys spending time with his wonderfully supportive wife, Christine, and playing a variety of sports. You can communicate with Brian on his author forum at Reef Central. After becoming one of the lucky few, in November of 1967, to be born a Texan, I spent the first ten years of my life in Germany, Vietnam and Thailand as a military brat. Upon returning to the United States, my family settled in, of all places, central Arkansas where I have lived for the past twenty-five years. Having graduated from the University of Arkansas with a degree in nursing, I will do so again in the fall of 2003 with a Bachelor of Science in biology and minor in chemistry, also from the U of A. 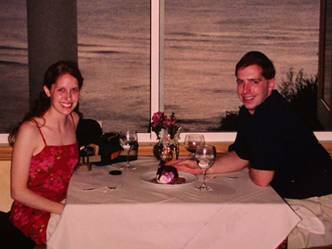 For the past fifteen years my spare time away from reef keeping is spent working for an air medical program at Baptist Health Medical Center in Little Rock, where I met my wife Roxanne. While Arkansas is not exactly a hot bed of marine enthusiasm, my isolation has driven me to travel and learn far more than I thought I ever would about this hobby. My treks have taken me to workshops and conventions in Athens, Baltimore, Dallas and Chicago in effort to hone my husbandry skills for marine animals. I practice my craft on a 120 gallon plenum system that consists of primarily large polyp stony corals and soft corals. My success in the hobby is not without the help of my two sons and every family member that has undergone my crash course in marine tank emergency preparedness. Chris Jury was always fascinated with living things. In early childhood he was especially taken with dinosaurs and other prehistoric animals. As he grew older living animals (especially from exotic locales) intrigued him. His interests led him to amass quite a menagerie of pets during his adolescent and teenage years (much to the dismay of his parents). While he enjoyed fishing and maintained freshwater aquaria for brief periods over the years, it was not his passion. Fish were, he began to think, a bit geeky. At the age of 16 his family took a vacation in south Florida. While he was familiar with coral reefs, had read a bit about them, and thought they were intriguing, he had never seen one in person. His first exposure was on a glass-bottomed boat off of Key Largo, FL. The sea fans swaying in the current and Stoplight parrotfish crunching at the reef substrate was far more beautiful than he had ever imagined. He spent as much time as he could in and around the water for the remainder of that trip. Upon his return he read more about reefs and even allowed himself to wander into the fish room at the local pet shop. Before long he had set-up his first reef tank. 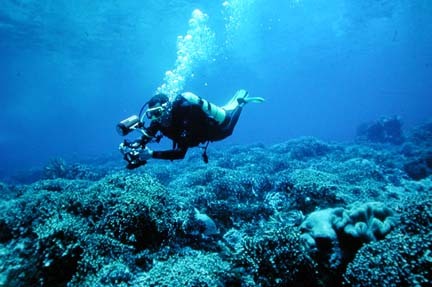 He has visited various reefs since then and hopes to be able to continue to do so. He has maintained coral reef aquaria for a number of years and has also worked in retail aquarium shops off-and-on for more than three years. He is an active member of several online message boards and has given presentations on various aspects of coral reef ecology to several groups. A member of the Honors College at Michigan State University (East Lansing, MI: GO GREEN! ), he is completing dual bachelors degrees in zoology and Spanish and plans to pursue graduate work in the area of coral reef ecology in the near future. He likes fish now, but still maintains that he is not, in fact, a geek. You can communicate with Chris on his author forum at Reef Central. Cliff Babcock graduated from the University of Maryland with a degree in entomology and a minor in plant pathology. He worked for the Maryland Dept of Agriculture in Nursery Inspection. He switched to the State EPA for a while. He then worked for private enterprise heading up the pest control implementation & educational programs for a larger pest control firm. After 5 years of that, he started his own Pest Control Business and has been doing that for over 30 Years. He has had aquariums since he was 7 years old & has been addicted to both salt and fresh water organisms every since. He is particularly interested in the smaller micro-organisms that occupy our tanks such as bacteria, cyanobacteria, dinoflagellates, algae....etc. He is also interested in any information regarding water chemistry as the research makes it available. He has an interest regarding pest control in the reef aquarium. Dave (aka Wolverine) grew up in Salt Lake City, UT. He has a B.S. in Biochemistry from the University of Michigan (Ann Arbor, MI: GO BLUE!) and an M.D. from Creighton University (Omaha, NE). He's currently in his ophthalmology residency training at Henry Ford Hospital in Detroit, MI. Dave got his start in the saltwater hobby seven years ago with a Niger trigger and a Blueline grouper in a tank that was WAY too small (the largest mistake among too many to count). He graduated to reef tanks two years later, shortly after discovering the value of aquarium bulletin boards on the Internet. The little free time he has is spent with his wife and their Norwegian Elkhound. Prior to his recent involvement in the medical profession, he also enjoyed playing basketball, reading and mountain-biking. His bulletin board user name comes from his alma mater, not from the comic book character (though Wolverine is his favorite of the X-men). He is one of the moderators of the Reef Fishes forum. Doug Wojtczak has been involved with fish since 1971 thanks to his father who bought him his first tank. After many years of success with freshwater, in January 1998, he walked into the local fish store looking for some food for his freshwater fish and saw something called a reef tank and the most wonderful looking orange fish (Tomato clown) that he had ever seen. That very day, on the recommendation of the store owner, he came home with a 29-gallon tank, a heater, a bag of salt and no knowledge whatsoever of what he was getting himself into. Shortly thereafter, realizing that he had no idea of how to care for these animals, he found the Internet. At this point he read every bit of information that he could find and after three short months a new 75-gallon tank was being delivered to his home. He had never realized that he was now involved with a hobby that has turned into the most addictive passion that he has ever imagined. After the first 18 months of learning, studying and researching, his 75-gallon tank was featured in a popular online reefkeeping magazine (AFM online) in November of 1999. After that honor, in March of 2000, he felt that he had enough skills to setup another tank which is a 90-gallon SPS reef tank utilizing all of the information that he learned from other reefkeepers on the Internet and the Reef Central message board where he has been a moderator since January of 2000. With the help of his wife and son he also keeps a 55-gallon semi-reef tank, and 20-gallon micro reef along with the 90-gallon and 75-gallon reef tanks. He is now in the process of planning "the big one" which is going to be at least a 200-gallon mixed reef tank with all the bells and whistles. He acts as a consultant to a popular Chicago-land fish store and often offers suggestions and information on how the local fish store owners can advance the hobby by offering propagated corals and tank-raised animals. On a personal note, Doug is married and has a son. He is Director of Information Technology for a large financial services company in Chicago, Illinois. 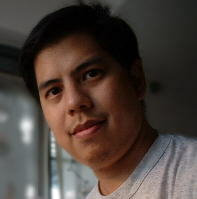 He is also a part-time web designer, computer consultant and both the Senior Editor and webmaster for this magazine. His other hobbies include bodybuilding, Ham radio, performance cars and reef tank photography, just to name a few. 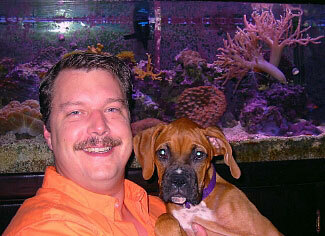 Dwayne Sapp has been an avid hobbyist involved in saltwater tanks for a little over 3 years. He started out reading Aqualink and visiting LFS. His first tank was a 125-gallon AGA set up as a reef tank, which has gone through several transformations. His admiration of mandarins and the small critters in the tank stalled his progress in acquiring corals. Dwayne's endeavors to breed and raise mandarins led him into the world of 'grow it yourself' phytoplankton. He has successfully helped dozens of aquarists set up phytoplankton culture stations. Dwayne is an active member in TCMAS (Twin Cities Marine Aquarium Society). He is also a native Texan and often questions the wisdom of living in Minnesota, where he resides with his wife and three boys. Dwayne is a Senior Application Engineer for the leading Fiber-To-The-Home manufacturer. Because his business travels allow him to visit other reefers and LFS around the country, he can often be seen trying to explain to airport security personnel what exactly is in those plastic Baggies. 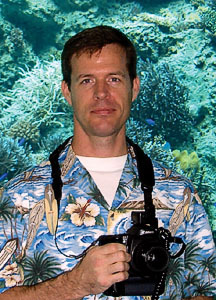 Eric Borneman is the author of Aquarium Corals: Selection, Husbandry, and Natural History, and is co-author of the book, A Practical Guide to Corals. He has authored and published over almost seventy articles and papers on marine subjects in various scientific and trade publications and journals internationally. He is the host of The Coral Forum at Reef Central, is a contributor to many websites internationally, has spoken at many scientific and aquarium related conferences, events, and societies, and has taught classes on coral biology, coral propagation, and other reef issues. He co-founded the Marine and Reef Aquarium Society of Houston and is currently involved with reef conservation efforts, coral disease, and aquarium trade sustainability issues worldwide. He has been maintaining reef aquaria for twelve years, and has been diving and photographing coral reefs of the world for 23 years. His current aquaria include a linked multi-habitat system of over 500 gallons that includes a seagrass habitat, an intertidal habitat and a large coral reef that run without any filtration devices. Eric has a degree in biology from Rice University, and is currently working on his Ph. D. in coral reef ecology in the specialty area of coral disease and immunity at the University of Houston. He lives in Houston where he is at work on his next books. Frank Marini was born and raised in Hudson Mass. After high school he joined the Army and moved to Ft. Benning GA to complete his Military education. Four years later he returned to Massachusetts to complete college and received his BS in biochemistry. His first job as a research assistant at Scripps Clinic and Research Foundation in La Jolla Ca showed him that translational research in medicine was soon to be his chosen career path. In 1989 he moved to Houston TX to begin his graduate training in Molecular biology at the University of Texas - Houston. He completed his Ph.D. in 1995 where his research focused on Gene Therapy of Cancer. Frank's expertise in gene transfer and gene delivery into stem cells is well-recognized, and he has developed viral vector gene delivery systems, which have been used in clinical trials for treatment of cancers. He is currently an assistant professor in the W.M. Keck Center for Cancer Gene Therapy at M.D. Anderson Cancer Center. From the start, fish and fish tanks intrigued me. My parents setup my first tank, a 30-galonl metal-framed tank containing seahorses when I was 12. I was hooked from that day on. Since then, when I've had a permanent residence, I've kept a number of different fish and have always focused on predatory and unusual fish. I started my first reef tank in 1986, and my first large fish-only system in 1989. I fell in love with the Banggai cardinal fish in 1995, and after solving the sexing issues, had multiple successful breedings. I have been credited with having the first reported breeding of these fish and successfully raising the fry. In 1997, I scaled up my Banggai breeding and was able to supply over 300 Banggai fry to local Houston pet stores. I continued Banggai breeding for a few years thereafter, but again have focused on predatory fish (mainly the scorpionfish family: lionfish, etc). My interests are diverse and always educational. Besides saltwater fish, I have a 125-gallon freshwater planted tank. I raise matamata turtles, frequently play my bass guitar, and whenever possible cruise in my 400Hp 5.8L 1986 Mustang GT (the MXMISL). Frank is available for questions at the Fish Breeding and Marine Fish forums at Reef Central. Greg Hiller has been active in the reefkeeping hobby since 1996, starting out in the early days using Compuserve's Fishnet forum as a troubleshooting resource. The lessons learned online from experienced aquarists resulted in such rapid coral growth in his tanks that he needed to learn and develop techniques of coral propagation/fragmentation. Greg has raised several species of marine fish and propagated dozens of species of soft and hard corals, and anemonies/corallimorphs. Greg is a founding member of the Boston Reefer's Society (BRS) and was a member of the board of directors for several years. As a frequent monthly meeting speaker, Greg has helped educate and contribute to the success of many Boston area hobbyists. Greg holds a Ph.D. in chemical/biochemical engineering from U.C. Berkeley which he believes has contributed to his success in the reefkeeping hobby. Understanding the basics of chemistry, combined with biology and engineering have helped with numerous fishy-type projects from raising seahorses to building calcium reactors. Greg has authored a number of articles for online hobbyist publications, most dealing with chemistry aspects of the hobby. Greg currently works for a major biotechnology company in the bioreactor process development group. A fish in another life, Greg feeds his incessant need for saltwater by keeping 180-gallon and 150-gallon reef tanks, diving as often as he can in the Atlantic and Gulf of Mexico, and volunteering as a diver at the Florida Aquarium. "The obsession" took root for Greg about eight years ago after becoming a certified diver. Greg started out with a small 40-gallon tank and a few damsels. As his interest in the hobby grew, so did the number of tanks and their occupants. Now, his 180-gallon reef inhabitants regularly breed and multiply. Greg has spent countless hours surfing the various reef related forums, spending most of his time early on at Aqualink and gradually spending more and more time on Reef Central. Living in the Tampa Bay area isn't close enough to the reef, but it will have to do for now. He is joined by his wife, Vicki who is an author of contemporary fiction and their miniature American Eskimo, Pie. Greg pays for his addiction by consulting for various software development companies. From his home, Greg oversees an intricate network of computers that houses several websites, including SaltyZoo, where you can find even more about Greg and his affection for the underwater environment. 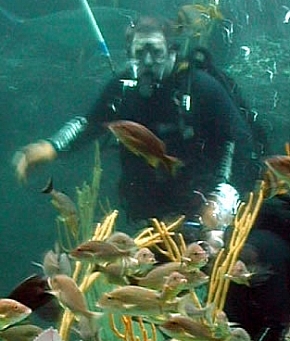 As an amateur aquarist Henry C. Schultz III has been around aquariums for 20 years, 15 of which were marine tanks. Credit goes to his father for getting him involved in the hobby. It was a FO 55-gallon aquarium with two clownfish and a yellow tang. Early on it was more of a fascination, but soon the fascination grew into a passion. Now with three saltwater reef tanks, he has successfully bred Banggai Cardinals, Orchid Dottybacks, Green-banded Gobies, Red-Headed Gobies, and Banded Pipefish. More than anything, Henry loves to see pairs of fish spawning in his tanks. 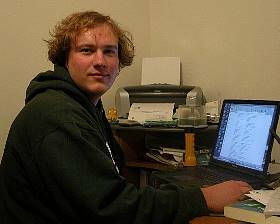 In 1996 Henry was introduced to the Internet and has since volunteered countless hours on numerous Bulletin Boards. 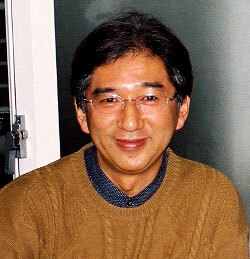 He was a consultant to the Aqua Link web forum when he helped co-found Reef Central in 1999. He remains an active participant and moderator at Reef Central. Most recently, Henry has founded the Central Illinois Marine Aquarists, a local reef club. Henry is available for questions at the Fish Care forum at Reef Central. Residing in Miyazaki City, Japan, Hiroyuki is one of the authors of Angelfishes - a Comprehensive Guide to Pomacanthidae (2003). He has written articles for Tropical Fish Hobbyist (USA), Marine Aquarist, Fish Magazine, Tropical Marine Aquarium, Salt & Sea (Japan), Aquaristik (Germany), Aqua (Thailand), etc. He is also a photo and article contributor for several websites in the USA, Germany and Japan. Hiroyuki is currently preparing several scientific papers and a book titled, Fairy & Flasher Wrasses. An amateur hobbyist, Horge Cortes Jorge Jr. has husbanded marine organisms since the late 1960's. Fascinated since childhood with the sea and its inhabitants, and blessed with easy access to the wild reefs of his country, the Philippines, he has involved himself in various reef-related, private sector and pro-environment initiatives particularly with regard to monitoring since the mid 1980's. Happily married, and therefore growing quite fat, he also helps staff the online discussion board and psychic-hotline for reef aquarists at The ReefTank. You can also communicate with Horge at his author forum on Reef Central. James Fatherree has been an aquarium hobbyist since childhood, has been keeping marine aquariums for well over a decade, and has spent many days diving in Florida, Hawaii, the Bahamas, Japan and Indonesia. He also managed a large retail aquarium store, owned and operated an aquarium design, installation, and maintenance business for several years, and spent a summer working as a diver/collector/slave for an aquarium livestock wholesaler in Florida. James has also published well over 100 articles and 1,000 photographs in various aquarium magazines in the U.S. and Europe, and has written and illustrated five books on the topics of reef organisms and marine aquariums, too. Aside from his lifelong aquatic interests and experiences, James served as an Army paratrooper, earned degrees in Geology from Mississippi State University and the University of South Florida, with a specialization in invertebrate paleontology, and has traveled around the world. He also lived in southern Japan for two years where he taught English, and is currently a physical and environmental sciences instructor at Hillsborough Community College in Tampa, Florida. 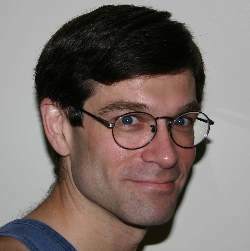 If you'd like to know more about the author, visit his homepage at www.fatherree.com/james.